← Financial Geopolitics Distorting Capital Market System. Improving systemic approaches to markets is a never-ending iterative process of back-testing and building on previous experience. Fortunately, every once in a while, it can be highly rewarding. With enough time, testing and good fortune a major breakthrough happens and a spectacular improvement in results is found. The chart in the header shows that the back test model (which I call the bond selector) has a significant and consistent improvement in results. The testing period uses the maximum available data, as it is only over this period that all the bond ETFs in the model have existed. 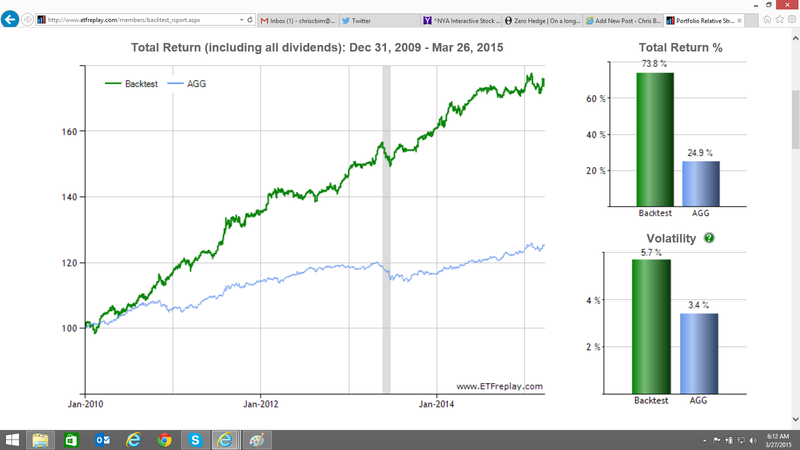 The comparison benchmark is the widely used AGG ETF. This is a low cost, diversified U.S. investment-grade bond market fund from iShares. The improvement in annual returns jumps from 4.4% to 11.2%. The chart also shows that volatility increased with the new model. However, their are many different measures of volatility. One of the most important measures is the worst drawdown experienced. This is another way of saying what is the worst loss that could have been experienced by picking any 2 time and price points. Here the drawdown on the bond selector is actually lower than even the low risk AGG. AGG had a drawdown of -5.1%, but the bond selector fell only -4.6% in the worst case. The grey band in the chart above shows when this happened. Another point to make is that the bond selector can switch entirely to SHV, which is Treasury bills, if there are no positive trends in the model. In certain circumstances, therefore, the bond selector can become much lower risk than AGG. In every other metric the bond selector clearly outperforms AGG. The sharpe ratio goes up from 1.26 to 1.88. Furthermore, in every calendar year the bond selector not only has a positive return but also a higher return than AGG. The major improvement once again came from Cycle Dynamic thinking and it has been possible to continue to improve the models from the initial launch last December. It is time for an update soon but here is the original concept.